Typical application. 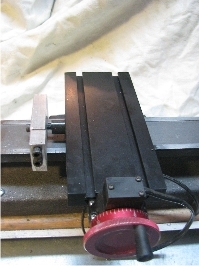 Accessory clamps onto the 55° dovetail lathe bed of Sherline’s lathes and acts as a mechanical stop for the lathe. A pair can be used to lock and stabilize the cross-slide of the lathe when used as a mill table. Mill. When using the lathe cross-slide as a mill table, you may have experienced difficulties in milling operations, in particular when using the boring head, fly cutter, or when working on steel. The reason for this is the lack of rigidity of the cross-slide when it is used as a mill table. The cross-slide jiggles around too much, which can be very dangerous. Sherline’s mill tables come with a lock (for one direction), but not the lathe cross-slide. Since it stabilizes the cross-slide for milling operations, the mill dovetail lock will help remedy this problem. One can still move the cross-slide perpendicular to the lathe bed, but a pair of dovetail stops is required. The same accessory can also be used for lathe work; typically, just one stop suffices for this. Lathe. Even with a DRO (Digital Readout) or zero adjustable hand wheels, it is often convenient and time saving to have a mechanical stop for a lathe. For example, when turning down a work piece, since you cannot over shoot the cut once the lock is set, you don’t need to closely watch the DRO. Therefore, this accessory can also be considered a safety feature. Once set correctly, you will never hit the rotating lathe chuck by accident. Further specifications. 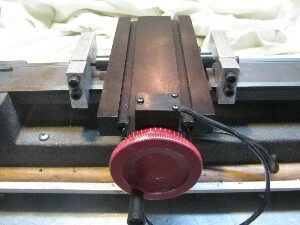 The height over the lathe bed of the stops does not exceed the height of the cross-slide. Thus, the stop does not decrease the swing over the cross-slide. The width of the standard dovetail slide stop amounts to only 0.5”. This compact design assures that the distance between centers is not significantly affected. Other sizes are available on request. Steel vs. Aluminum. The aluminum accessory is just fine in our opinion. Some customers love steel; therefore, we also offer this tool in steel. Pricing & blanks. Dovetail accessories are time consuming to machine and difficult to measure. 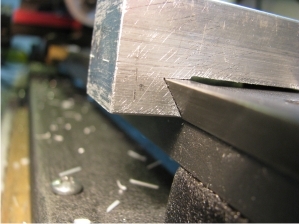 In particular, Sherline’s 55° dovetail is very unusual and requires specialty tools for machining. Additionally, drilling and taping numerous holes is labor intensive. If you want to do part of the work yourself, go for the less expensive dovetail blanks. We also offer a project booklet (that comes without any hardware) for assisting you to machine the entire accessory alone. Note that all accessories fixed on the lathe bed have a base that will look similar to our dovetail stops/locks. Thus, if you would like to machine yourself a tailstock, 90° tailstock, adjustable tailstock, steady-rest, indexing tool, ... you would need that kind of dovetail design. Therefore, the blanks are useful. Other sizes are available on request. Procedure. Loosen the screws on the front end of the lock. (You don’t need to remove the screws. The screws we provide are long enough.) Slide the lock over the lathe bed and lock it. Fine adjust the position of the lock with the horizontal screw. That screw will also be used to lock the cross-slide for milling operations. All screws are socket head 10-32 steel screws. That size is used for nearly everything on Sherline lathes and mills. Safety Notes and Disclaimer. The mill lock is designed for Sherline’s milling attachment to the lathe and it comes with 55° dovetails. It will not work for other systems. For example, a different size would be required for Sherline’s mill table (available on request). Do not over tighten the screws. Doing so can damage threads and/or the cross-slide beyond repair. General safety rules for machine/power tools are in place. For an extended list of safety notes, consult the literature or go to our website. You can download a safety booklet free of charge. This safety booklet is also typically included (free of charge) for first-time customers. Use protective clothing including, most importantly, safety glasses for metal work. We do not warrant that any accessories can be used for any particular application. Usage of accessories or damage caused is at the risk of the customer. Neither LatheCity nor its owner shall be liable for damage arising from unprofessional use or misuse of LatheCity accessories. We try our best to keep our web sites and manuals current and error free. However, if you find incorrect information, please notify us. We will correct the mistake immediately. We will not accept incorrect prices listed by mistake. Current prices are those found on our web site. The Sherline cross-slide is shown in some of the images depicted here. None of the statements or procedures may coincide with Sherline’s Inc. opinion or interests. Neither LatheCity coworkers nor LatheCity’s owner are employees of/or agents for any of the vendors referenced in the text and they do not sell or represent any of the third party products discussed. Returns in resalable condition are accepted within 30 days after shipment day. The customer will cover all shipping costs. There are no restocking fees and no questions asked. No returns of custom designs, customized designs, or bulk orders (more than one unit) are accepted. General sales and business terms as given on our web site are active. Materials Typically, unless otherwise noted, LatheCity standard accessories are made from aluminum, which keeps the prices low and is sufficiently durable. In addition, the aluminum adapters are guaranteed not to damage, e.g., threads. Regarding the rusting of “stainless” steel pieces made by other vendors, this does not happen with aluminum adapters. Although we now have the option to select different materials for some of the pieces, we still believe that aluminum is just fine for most accessories of tabletop systems. We do not coat our accessories with a (black) oxide since this has no function, except to increase the costs. Typically, all surfaces are milled or polished, but small scratches may be apparent, even on new adapters. These are tools: not jewelry or furniture. We sometimes color accessories using a staining color. However, this is paint and not oxide coatings. We do test all products thoroughly (typically for at least a year) before offering them for sell. Don’t hesitate to contact us if you have any questions regarding the compatibility of our products with your system.